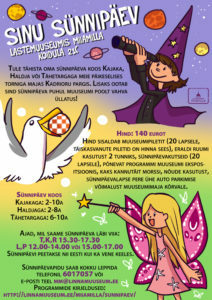 Why don’t you come and have your birthday party with the Seagull, Fairy, or the Astronomer in our sunny house with a tower in Kadriorg Park. The museum will help you celebrate your birthday with a fun surprise! Birthday parties for the children, who are interested in stars, planets, and the space. Ages: 6-11y Duration of the programme: 40-45 min; use of the birthday room: 2 h. Also, all birthday guests get to stay at the museum until the closing time at 6 p.m. The birthday guests tare taken to the museum’s observatory by the Astronomer, where they can get acquainted with the planets of our solar system. In the observatory, all children can make their own small “Leaflets of planets”, in which they can glue all nine planets along with their descriptions to make sure that they won’t forget anything interesting about the planets. Birthday parties for the children, who love handicrafts and playing. Ages: 3-8 y Duration of the programme: 30-40 min; use of the birthday room: 2 h. Also, all birthday guests get to stay at the museum until the closing time at 6 p.m. The tiniest birthday guests get to make small butterflies with the Butterfly Fairy and their parents and play fun games. Older children are taken to visit the observatory, where there is a small surprise for them and they get to make a cool fairy with the help of the Butterfly Fairy. Ages: 3-11 y Duration of the programme: 30-45 min; use of the birthday room: 2 h. Also, all birthday guests get to stay at the museum until the closing time at 6 p.m. There is a seagull residing at the museum, who really values friendship. The Seagull likes to discuss whether friends should be more attentive towards one another, whether an animal can be a friend for a human, and what is it about friendship that makes it so great. The Seagull is playing games with the children, which focus on friendship and attentiveness. A very special piece of headwear is also made with the help of the children and a secret place is visited at the museum. Birthday parties can be held in Estonian or Russian language. Price: EUR 150 The price includes: • Museum tickets for up to 20 children. If there are more than 20 children, double fee will be charged for the birthday party. Attention! There should be at least one adult per 5 children, who will help to ensure that the children remain healthy and happy at the party. The price includes tickets for the adult supervisors. • Use of a separate room for 2 hours. In the case of staying for longer than 2 hours, and additional hourly fee will be charged for the use of the room. • Invitations to the party (up to 20 pc). The invitations are available from the ticket booth of the museum in good time before the party. NB! In the case of cancelling your booking, you can return the invitations or pay a separate fee for the invitations (EUR 0.50 per pc.). • An exciting programme in the exhibit halls of the museum. • Two jars of lemonade. • Use of dishes (cups, cake plates, cake forks for 24, kettle and coffee maker). • A parking space for one car of the family of the host of the party next to the museum building (at the Koidula Street end of the building). The guests may park their cars in the car park of Kadrioru Stadium (2.5 h free of charge) or free of charge in the car park of Kumu, following the rules of traffic management of the City. To book a birthday party, please call 6017057 or e-mail mm@linnamuuseum.ee Birthday parties can be organized: Tue, Wed, Fri: 3:30 p.m. – 5:30 p.m. Sat, Sun 12 p.m. – 2 p.m. or 3 p.m. – 5 p.m. Important information: • The birthday room is made available for making preparations 15 minutes before the party. • During the party, the parents should keep an eye on the children in the exhibit halls, instruct and assist them, if necessary. • You are welcome to bring your own food and drink. NB! Alcoholic beverages are not permitted in our building. • Only regular cake candles may be used at the museum – the so-called volcano candles may not be used due to fire safety and safety regulations. • The parents should assist the children in the game of hide and seek. • Please take off your shoes and wear socks or indoor footwear in our building. • Strollers can be left in the special covered area on the outdoor terrace of the museum, which is designated for this purpose. Please bring a bike lock to attach your stroller to the wall. If necessary, locks can also be borrowed from our information desk. • Please coordinate inviting any performers (musicians, face painters, circus, etc.) with the museum in advance. • There are also other museum-goes visiting the museum. The birthday party guests should behave properly and politely in the exhibit halls so that the children remain happy, the museum exhibits intact, and everyone can enjoy a pleasant and memorable visit to the museum!